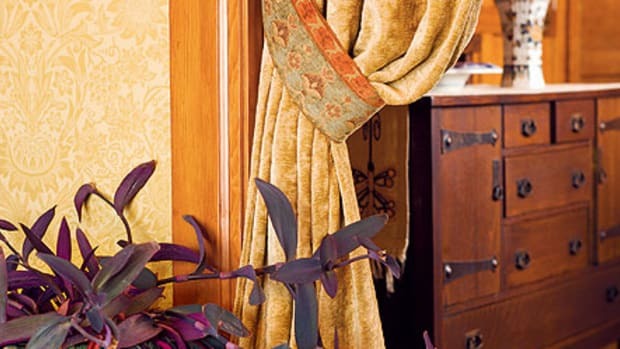 From the turn of the century till World War II, window treatments moved from Victorian excess through Arts & Crafts simplicity and then settled into classic historical styles. 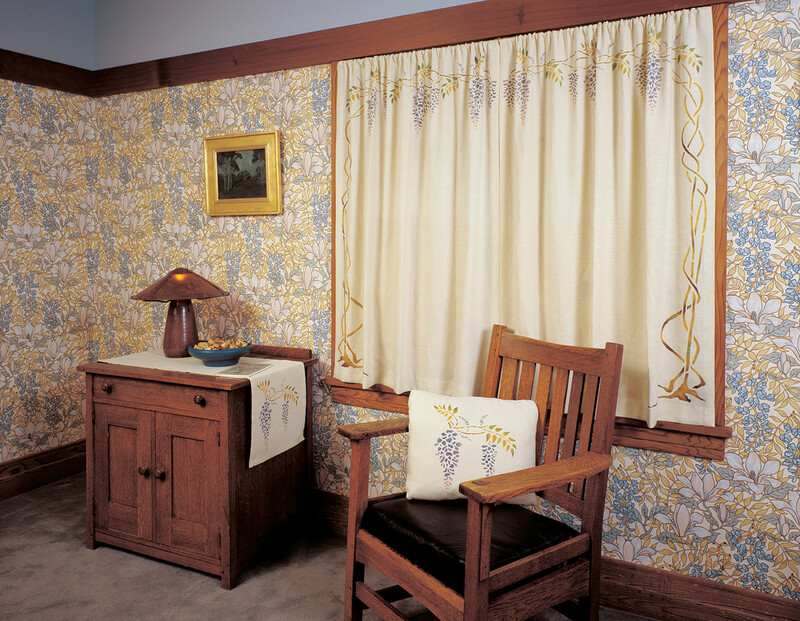 Window dressings changed along with everything else as the Victorian era drew to a close, and Arts & Crafts became influential, at the turn of the 20th century. Lower ceilings meant a change in window proportions. 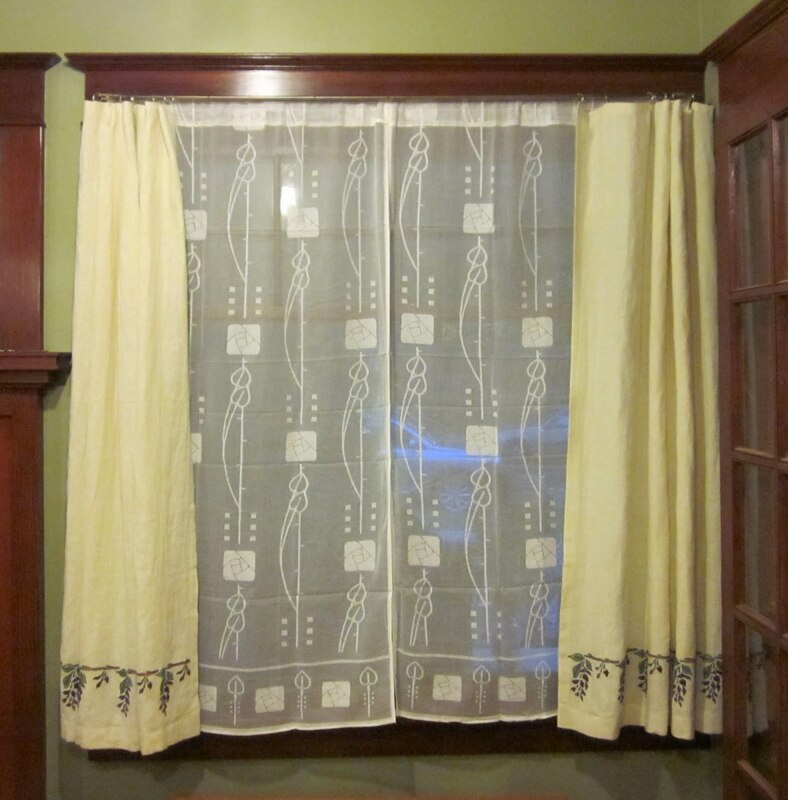 Everything was more informal: curtains often ended at the sill rather than puddling on the floor; dressings included just one or two layers (maybe with a valance or pelmet). Drapery panels attached to simple rings, hung from fabric tabs, or were shirred on rods, doing away with the fancy cording and tiebacks of the 19th century. Stenciled wisteria on cream-color linen lightly embellish a simple treatment by Arts & Crafts Period Textiles. Utility areas might have just a roller shade, which was also used in bedrooms or as a first layer. Venetian blinds and Roman shades were also seen in bedrooms. 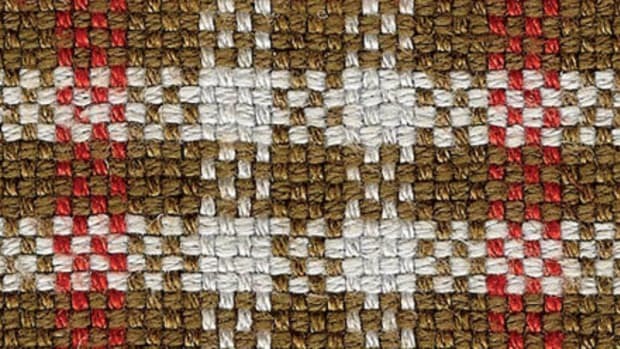 A typical treatment was a sheer or lace “glass curtain” mounted inside the trim, overlaid by unfussy drapery panels on rings (to open and close), and, for a more tailored look, a stenciled or embroidered top treatment. 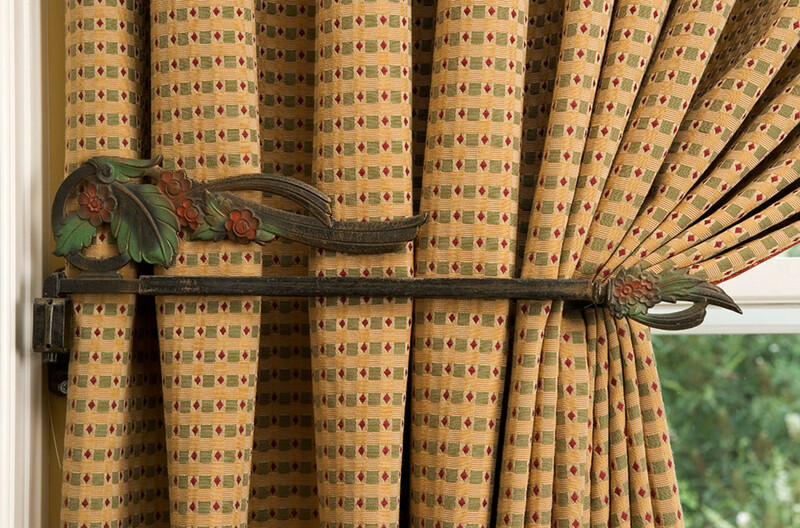 Samuel R. Scrottron had invented the manufactured curtain rod in 1892, then Charles Kirsch took it a step further with the first telescoping (adjustable length) rod in 1907. 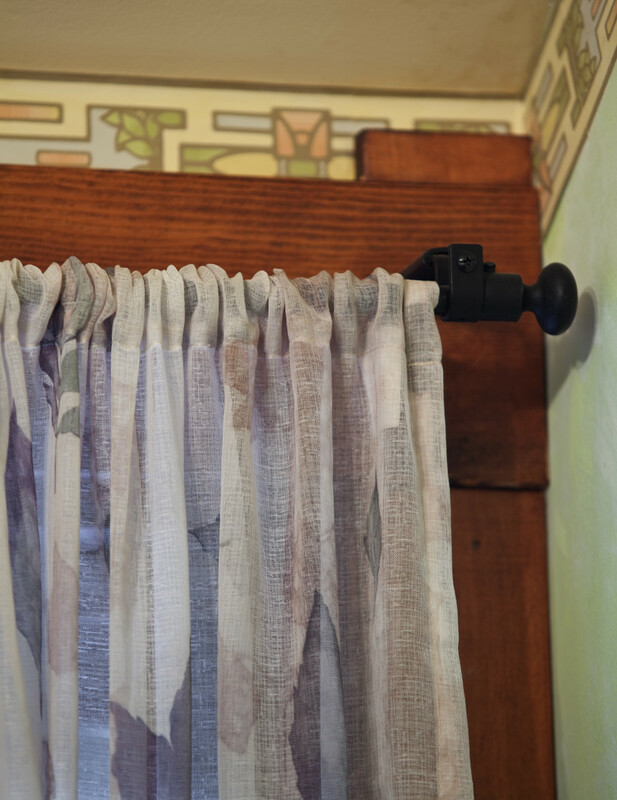 Now curtains could be hung on an inexpensive, 3/8" brass rod stock held by brackets attached inside the frame (inside mount) or on the header trim (outside mount). 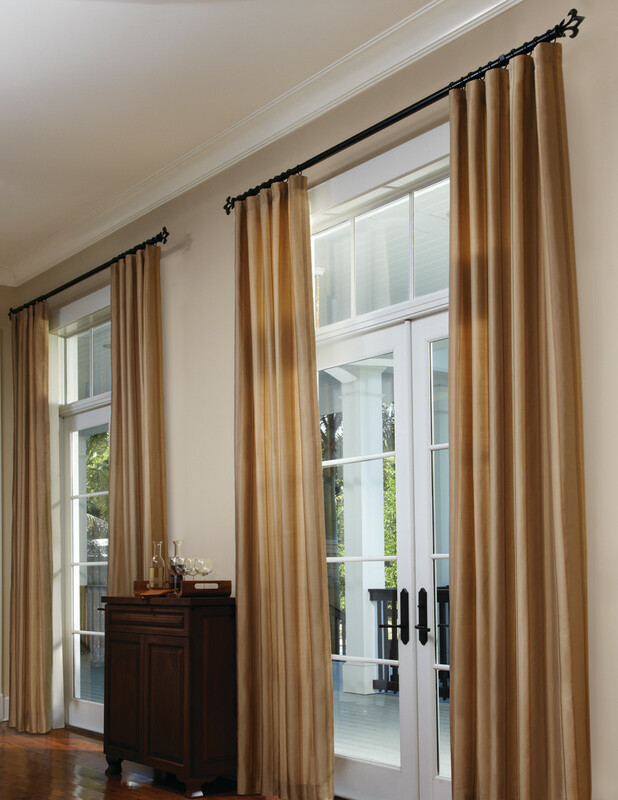 Café (half or sash) curtains of raw scrim, hand hemstitched, are shirred onto plain brass rods. 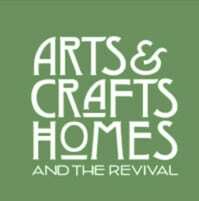 The informality of Arts & Crafts design gave way, during the 1920s, to the picturesque Historical Revival styles, Tudor and Spanish Colonial Revivals being the most familiar. European Medievalism returned; wrought-iron rods, often twisted and with spear finials, were in vogue. A period catalogue shows metal drapery rod styles: ‘Spanish’ polychromed in silver, red, and gold; ‘Ivanhoe’ in an elegant Statuary Bronze; ‘Colonial’ in ivory with urn-shaped finials. Swinging-arm rods allowed the entire curtain to be pulled away from the window. Muslin panels with an embroidered wisteria border hang over shirred lace curtains in the ‘Hunter Rose’ pattern, by Cooper Lace. Inside mounting (within the trim, tight to the sash) is the only option for windows in tight corners such as dormers, where there isn’t space for a wall bracket. 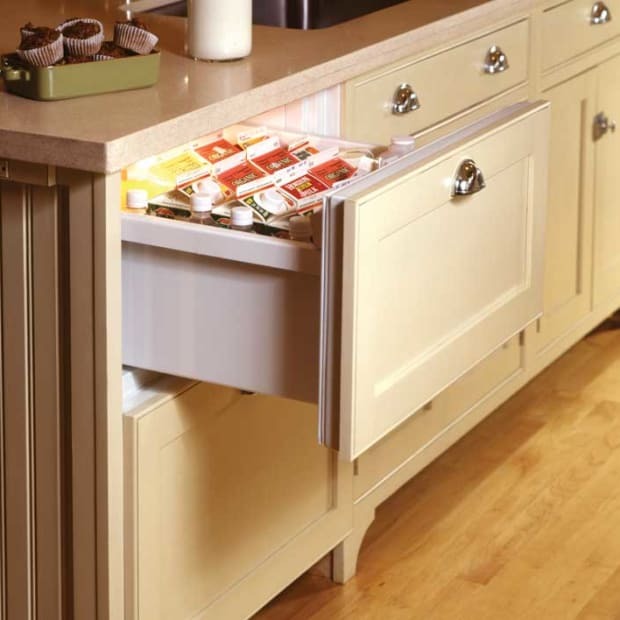 Inside-mount dressings are preferred when you don’t want to cover any trim. Inside-mount rods don’t hold the weight of outside-mounted rods and brackets, so inside mounting is better for lightweight curtains or a roller shade. Installing inside-mount brackets is very straightforward. 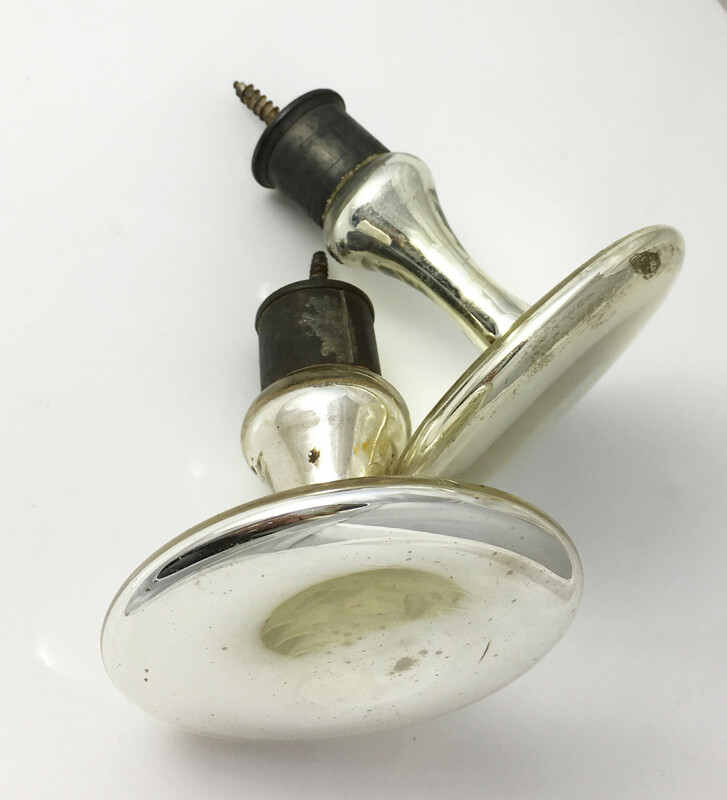 Tension rods (held in place with a spring, no brackets needed) are easiest and are all but invisible; some makers now offer tension rods with period-style “finials.” Be sure to leave clearance above an inside-mount rod for the curtain pocket or rings. For outside mounting on the trim, generally add 1 ½" on each side (3" overall) to the width of the rod. Measure the projection needed (away from the trim) for fabric to hang smoothly. (Typically you can buy 3/8", 1", and 2" projections.) Mount brackets on the trim (or, occasionally, in the wall). Remove the ferrules (the ridged collar that screws onto the right angle of the bracket). Gather the curtain onto the rod, then slide the ferrules onto either end of the rod; once the rod is in place between the brackets, thread the ferrules back onto the brackets to secure the rod. If, instead of shirring fabric onto the rod or using tabs, you are hanging ring on each side of the rod between the bracket and the end of the pole (to keep curtain sides anchored), then hang the panels and screw in the ferrules. Avoid alligator clips—they look too contemporary—and make sure the finish and color of the rings matches rod and brackets. 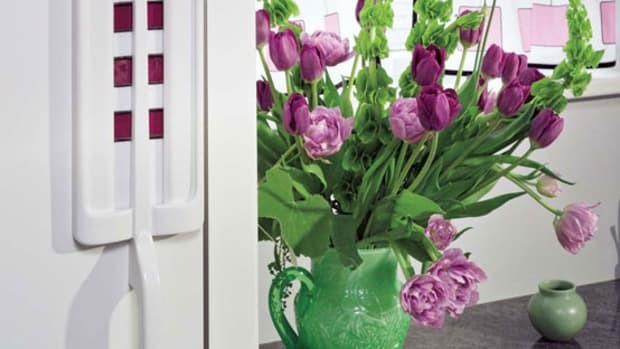 Hardware is by Kirsch, through Designer Drapery Hardware. 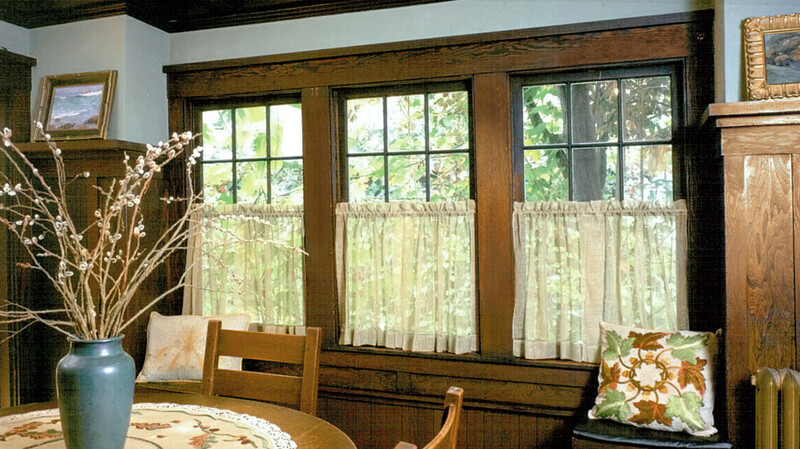 For large casement or multiple windows, traverse rods (invented by Kirsch in 1928) allow curtains to stack off the window for the most unfettered view. 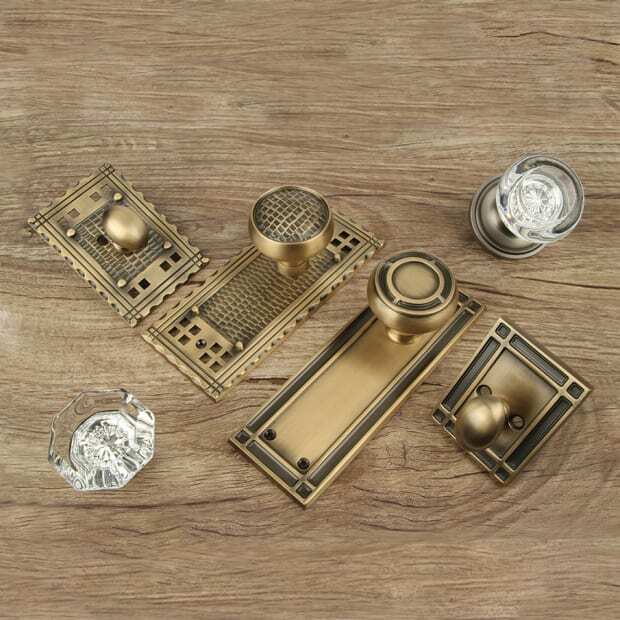 We suggest Kirsch’s Estate Wood collection in colors from mahogany to hazelnut and coffee, or Designer Metal Traverse Rods in bronze tones from caramel to black and gilded. IronArt by Orion has handsome, period-appropriate rods and hardware. If your Tudor Revival or French Chateau needs a little more glam, look at Amore Drapery’s cast-iron rods with gold-leaf finials. The basics transcend time, as with the classic treatment shown above. Over tall French doors with transoms, plain drapery panels hang from curtain hooks on rings, which travel on an iron rod with fleur-de-lis finials. Fancy tiebacks and holdbacks were rare for Arts & Crafts drapery. Between the wars, though, color and whimsy were in vogue, and inexpensive molded holdbacks shaped like Scotties and teapots were made for kitchen windows. Find vintage ones on eBay and Etsy for less than $10. 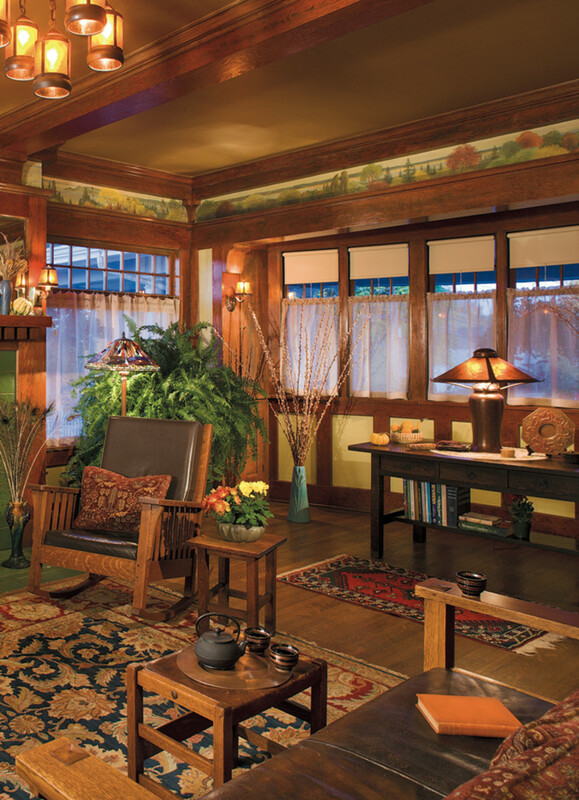 Arts & Crafts treatments are not full and rarely need to be held back, with the exception of pleated or heavy-fabric treatments at wide windows. The ca. 1920 polychromed swing-arm holdbacks (right) corral pleated curtains over a kitchen sink. 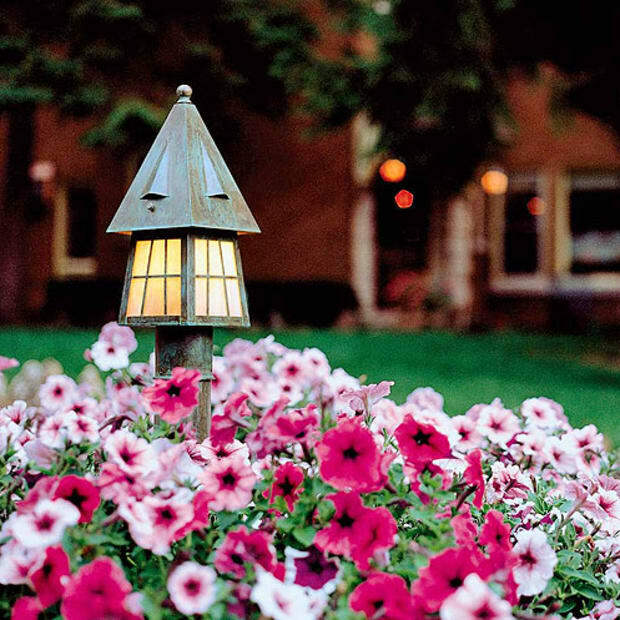 A mercury-glass pair of holdbacks (below) from Historic Houseparts is timeless. 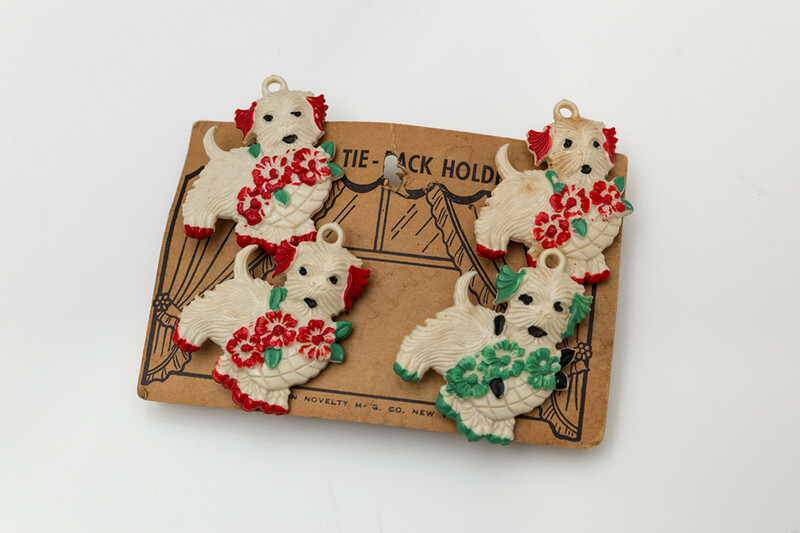 The Art Button Novelty Co. made all sorts of tieback ornaments in the 1920s­–40s. These plastic Scotties are from the 1920s; like those depicting flowerpots and teapots, they were meant for the kitchen. Invented by Charles Kirsch in 1928, the adjustable traverse rod moves drapery panels mechanically to “traverse” a window using a pulley cord, instead of by hand. A special pin is hooked into the top seam of each drapery pleat, and the pin slips into a small eye carrier that slides the length of the traverse rod’s metal track. Cotton cording runs through the length of the track and is wound around a pulley mechanism on one end, which opens and closes the curtains.